Bjorn Low is leading a grow-your-own-food movement that shows Singaporeans how urban farming results in self-sufficiency, better food waste management, and closer communities. Bjorn is integrating farming into cityscapes, helping Singaporeans reconsider the potential of their limited—yet promising—land. Through his organization, Edible Garden City, Bjorn uses farming as a tool to help communities produce their own food, lessen dependency on other systems, and experience the direct benefits from gardening. He created a decentralized model of pop-up farms that is accessible to anyone, anywhere in the city. This model relies on growing and providing healthy food for a neighborhood while composting garden waste. He works with communities, businesses, and the government to create an ecosystem of “agripreneurs” and gardeners who are working to transform the city into a more sustainable and inclusive space. Thanks to a steadfast strategic drive to implement these practices in a culture where the interest in gardening has varied from latent to averse, Bjorn has managed to build farms that have become community hubs. These hubs not only produce diversified food, but also give job opportunities to differently-abled people and serve as spaces of research, education, and connection with nature for urban dwellers. By using the cycle of growing food and managing waste, Bjorn is building shared experiences and relationships in a city-state that is more accustomed to valuing business productivity than natural growing systems. Bjorn is hoping to spread his model beyond Singapore to cities like Jakarta, Bangkok, and Hong Kong. He is an active influencer on the international urban farming scene, as a speaker at international conferences, where he shares his experiences and learns from his peers. He is building a network to help him replicate his model throughout Southeast Asia and is in discussion with like-minded urban farming social enterprises in Hong Kong and Indonesia. 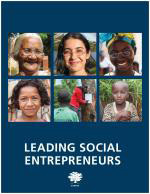 Bjorn' s story appears in the 2018 edition of "Leading Social Entrepreneurs" which features a selection of just a few of the Ashoka Fellows recently brought into the largest global network of social entrepreneurs. The LSE presents some of the newest innovations by leading social entrepreneurs whose ideas are changing the way things are done all over the world.